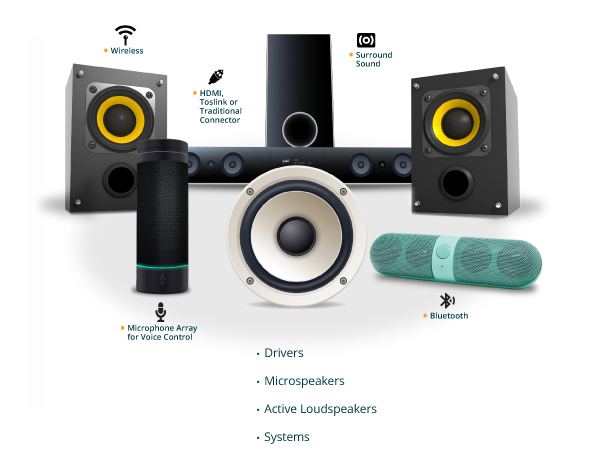 Loudspeakers & Microspeakers – Listen, Inc.
SoundCheck offers simple, fast and accurate testing of any loudspeaker – no matter what the form factor, functionality, connector or additional features. It measures a full range of driver parameters via traditional analog or digital, wireless/Bluetooth, Toslink, HDMI or USB connections, as well as microphone performance, surround sound and more. Please also see our page on Smart Speaker / IoT speaker testing to learn more about testing internet / virtual assistant enabled devices. of analysis and mathematical operations – for example, estimated resonance for finding the true resonant frequency (f0), quality factor (Q) and impedance (Zmax) of a loudspeaker. Display options range from comprehensive Microsoft Word or Excel reports to simple pass/fail output or writing to a database. Repeatable, automated tests are quickly and easily created, modified and saved using the simple point-and-click interface. 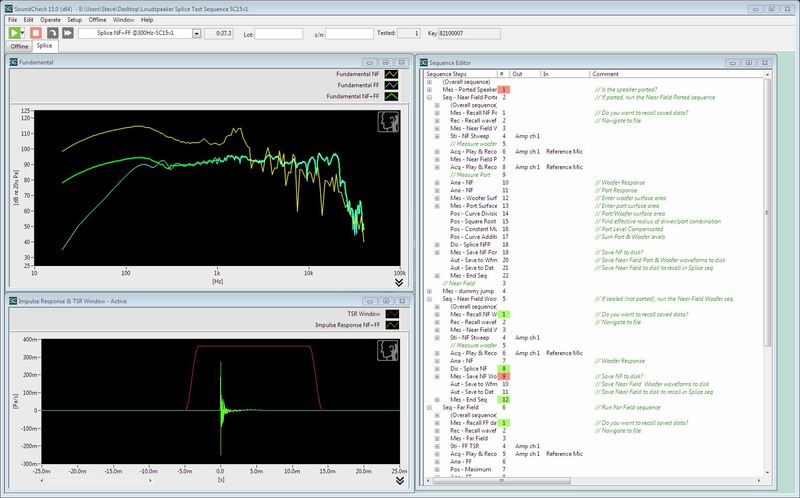 Several easy to modify sample loudspeaker sequences are provided for measurements such as Thiele-Small parameters, simulated free field measurements, polar plots, etc. and more complex sequences are available for specific test standards such as IEC 60268-5 and ALMA and AES standards. The software also controls the audio measurement hardware – an audio interface, measurement microphone, power supplies, amplifiers and optional turntable. 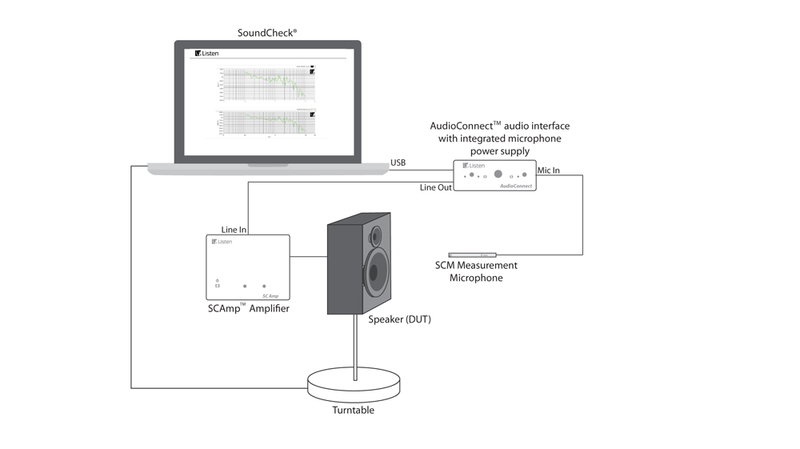 AmpConnect™: Listen’s all-in-one hardware includes an audio interface, amplifier, power and gain for up to 2 SCM or IEPE microphones, digital I/O, and integrated impedance circuit for all loudspeaker tests. SCM™ Measurement Microphones: SCM measurement microphones are robust, accurate, low noise and stable. SoundConnect 2™: A 2-channel microphone power supply (SCM, IEPE, 200V polarization) ideal for applications where polarization and high and low pass filtering are required. It also provides autoranging when used with SoundCheck to maximize the dynamic range of a measurement. AudioConnect™: A compact audio interface with power supply and gain for up to 2 SCM™ microphones. This is a very cost-effective approach for basic loudspeaker testing. SC Amp™: Listen’s audio test amplifier offers a patented integrated impedance circuit, fixed gain to reduce calibration errors and DC voltage offset support, along with low distortion and a low noise floor. BTC-4148 and BQC-4148 Bluetooth Interfaces: Designed for R&D and production respectively, these connect Bluetooth speakers to SoundCheck, offering full control over all Bluetooth protocol settings and explicit control over the CODEC choice and transmitter power. 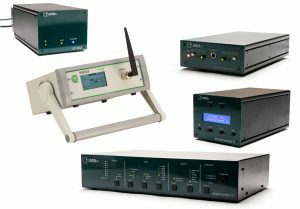 Also available for more complex test requirements: multichannel audio interfaces, MEMS interfaces, amplifiers, current monitors, and 3rd party hardware. In the R&D lab, SoundCheck measures loudspeaker design characteristics such as Thiele-Small parameters, voicecoil offset, polar response, spliced nearfield-farfield sequences and more. SoundCheck’s sequence editor makes it simple to re-run tests and compare results as designs are modified. 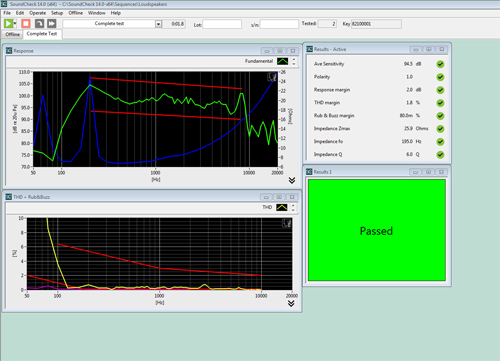 Powerful test capabilities, with many stimuli, analysis, post-processing and statistics options allow you to make all the measurements you need, plus offer unrivalled flexibility to calculate any parameters arising from these without leaving the system. 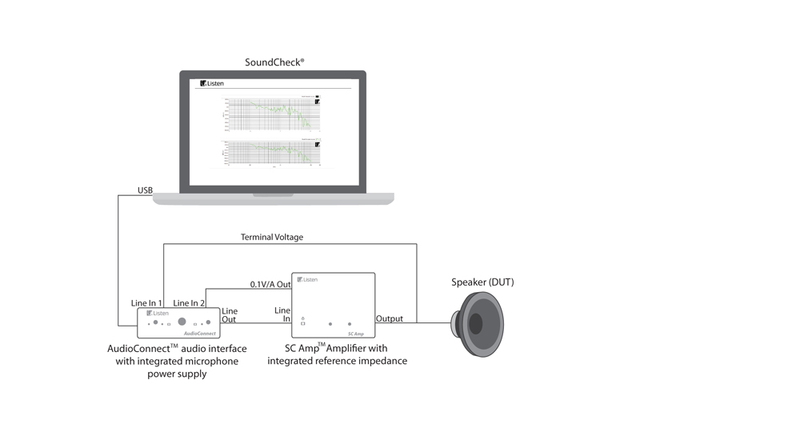 Unlimited test flexibility – although SoundCheck is pre-programmed with all common loudspeaker tests, it is so flexible that any test that you can conceive can be implemented. Simple point and click sequence development enables complex tests to be developed with no need for programming. SoundCheck is simple to calibrate, and measures to all loudspeaker industry standards such as AES, ALMA, IEC and more. 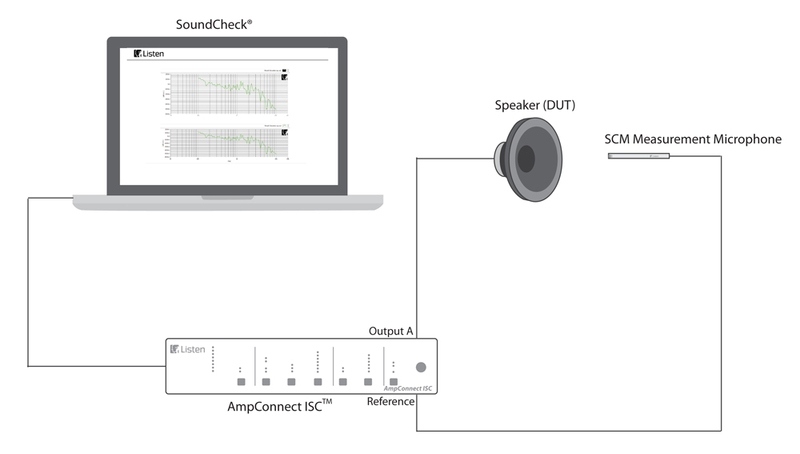 A simple loudspeaker or microspeaker test system, consists of the SoundCheck software, the AmpConnect ISC all-in-one test box and a measurement microphone such as the SCM. Listen also offers a wide variety of additional hardware for more complex loudspeaker testing requirements, such as AudioConnect (a compact and affordable audio interface), SCAmp (a powerful DC-coupled measurement amplifier) and SoundConnect (a measurement microphone power supply with 200V polarization). Testing specialty speakers, for example wireless or Bluetooth speakers also requires an interface to create a controllable connection between the computer and the device under test such as the BTC4148 Bluetooth Interface or the PIO-9216 Programmable Digital Serial Audio Data Interface. 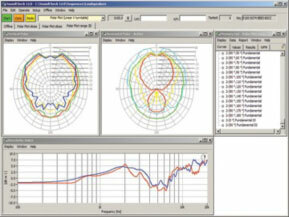 Below are some common R&D loudspeaker measurement test configurations. On the production line, SoundCheck offers extremely fast and accurate testing of microspeakers, drivers and speaker systems. This results in better quality and higher yields, as faults are immediately identified, enabling production lines to be halted before too much product is wasted. It is simple to operate, offers high immunity to background noise, and can carry out a complete production test including frequency response, Rub & Buzz (or perceptual Rub & Buzz), THD, loose particles, polarity and phase in as little as one second. Results can be compared to pre-set limits or a reference standard, and can be presented as a simple audible or visual pass/fail indication, a detailed failure mode analysis, or automatically written to a database. SoundCheck interfaces with barcode systems, footswitches and PLCs, and can be controlled via National Instruments Test Stand or LabVIEW for full integration with automatic production lines and large-scale test systems. A production line loudspeaker test system is considerably less expensive than an R&D system, yet contains all the functionality needed for production line loudspeaker test. 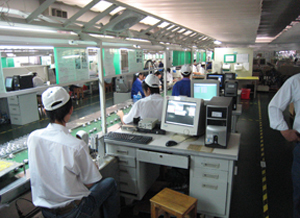 A typical production line loudspeaker or microspeaker test system, consists of the SoundCheck software, the AmpConnect ISC all-in-one test box and a measurement microphone such as the SCM. 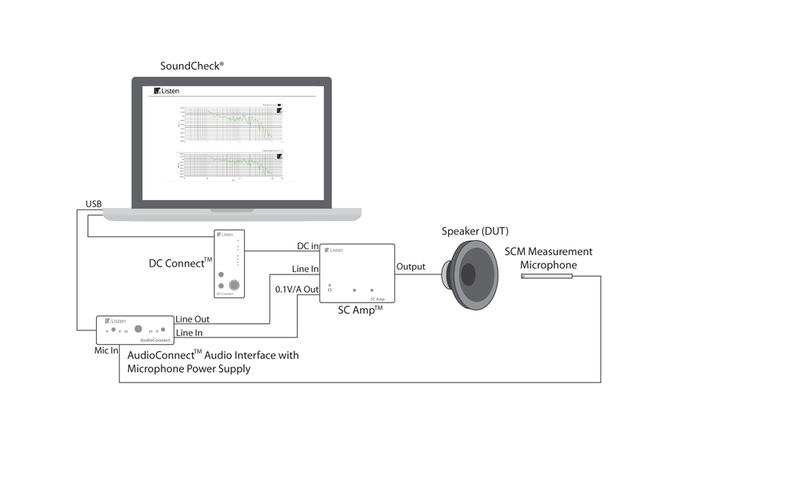 Examples: How do our Customers use SoundCheck for Measuring Speakers? More information? See the right sidebar to view detailed information about relevant test sequences, white papers, webinars and more about loudspeaker testing.